In late 2017, the state of Ohio added three new types of universal waste to its existing universal waste requirements. Universal wastes are not fully regulated as hazardous waste but can instead be managed under a simplified set of storage and disposal rules. The US DOT Pipeline and Hazardous Materials Safety Administration (PHMSA) issued Hazardous Materials Regulations (HMR) Emergency Waivers last month to streamline hurricane recovery in Georgia and Florida. While it would be nice if these two sets of regulations lined up perfectly, the truth is that they do not regulate the exact same “things.” Do you know the difference? Occupational Safety and Health Administration (OSHA) Deputy Director of Enforcement Programs Patrick Kapust announced the ten most commonly cited OSHA safety standards for workplaces in Fiscal Year 2018, which ended September 30, 2018. Add “exploding lithium batteries” to the list of occupational hazards that law enforcement officers face every day. The semi-annual Regulatory Agenda for Fall 2018 is out now. 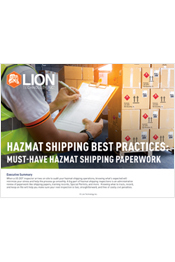 This Agenda provides insight into what kind of rulemakings major Federal agencies—including US DOT, FAA, EPA, and OSHA—have planned for the next six months. Here we take a look at new OSHA safety rules and updates to OSHA's 29 CFR worker safety Standards that employers should prepare for in late 2018 and early 2019.